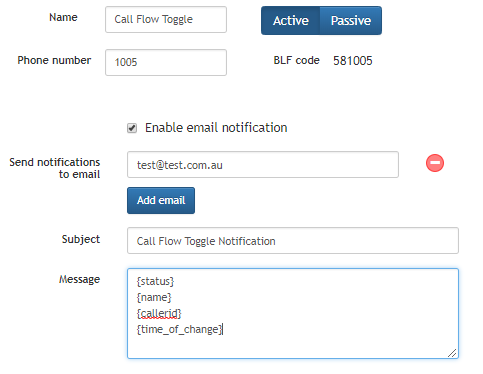 Introducing new «Call Flow Control» feature! PBX Call Flow Control – more power to the way you route your calls! 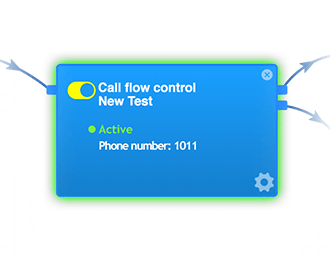 You have spoken, VoIPLine has listened and introduced the new Call Flow Control feature to your PBX. This feature comes with the customary blue object look-and-feel that our users love. The PBX Call Flow Control feature empowers you to forward calls to the proper destination you desire by a simple toggle of a switch. All you need to do is to decide the correct destination or group of users you want calls to be routed, then flip the switch and calls will be forwarded directly to that destination or group of users. Calls will continue to be forwarded to that endpoint until the switch is toggled again. This is especially handy in today’s gig economy where you have so many users that do not work regular hours and other tools like the Time Condition cannot be applied. To make it easy for our users to implement, we have marked the different endpoints of the toggle switch, Active and Passive. When the toggle switch is flipped to active, calls will be forwarded to active clause in the call-flow (Users or endpoints in this case can represent another branch office, a ring group, queue etc). The switch continues in the active state until the toggle is changed manually via the PBX portal or via a feature call placed by a handset. When set to passive, calls will be redirected the clause configured from inside the PBX configuration, this as an example could be IVR voice menus, call queues, ring groups etc. As an added security feature it is also possible to configure a email notification, which will allow you full viability as to when the toggle has been utilised and the current state it is in. Successful Stories - from customers like you. Having just been released, we have seen so many successful implementations of this feature which have garnered positive reviews among our customers. As an example, we recently had one of our clients in the Roadside Assistance Industry with various branches in Melbourne. The company had employees working in different teams across branches in different locations. The teams could not schedule regular hours since they are a startup company and their customers call in at random hours. They tried to use the Time Condition object but found it difficult to structure definite times for their teams. When the Call Flow Control object launched they immediately deployed it on their PBX to give them give them more control of how their calls were routed. Many instances of the Call Flow Control object were deployed among their teams in different locations attached to queues and inbound numbers. When a team was busy, which can vary anywhere from 20 minutes to 2 hours, the switch was toggled so that another team within Melbourne could respond to customers’ calls. This feature gave them more power and autonomy to control how calls were routed and also ensured that calls were easily forwarded to available agents. You do not have to run a large organization with multiple teams to use this feature. One of our clients running a local pet sitting business found this very practical. Since her hours are not properly defined, she uses the toggle feature when she is available but when not available she forwards it to an IVR (Interactive Voice Response) that helps her keep in touch with her clients in her absence. This has increased the overall satisfaction of her clientele, while improving her overall professional brand which leads to increased customer retention and productivity. Feature Usage - how do I make use of the new feature? This new feature is located alongside other features on your PBX tool box. You can easily configure it by dragging the object from the tool box kit into your PBX call flow screen. The set up is also very intuitive; all you need to do is to click on the gear configuration button and complete the fields as shown below. The BLF or busy lamp field code allows you to dial the number from an extension within your network to toggle the switch rather than pressing the Active/Passive button. When you have completed the configuration, click on the save button and link the active and passive clauses to objects from within your call flow. Do not forget to Apply the configuration when you have completed the setup. If you would like to know more about how to set up this new feature and the description of all the fields in the components settings, please click on the link below to access the knowledge-based articles online. We also have an extensive library of articles and videos that will not only get you started in no time, but will help you build a powerful PBX customized to suit your business needs.